The Public High Schools Athletic League in New York is known for producing top-notch basketball teams and players. However, it turns out not every school is lucky enough to have its own home court. So in Bensonhurst, a local Catholic parish has opened its doors. 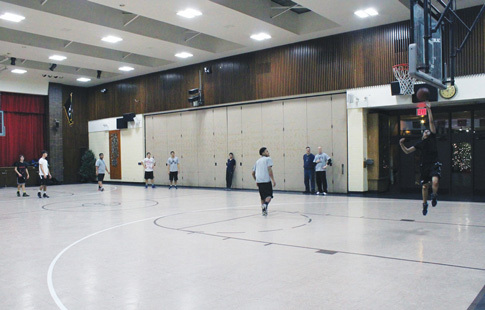 Starting this season, St. Dominic’s Church on Bay Ridge Parkway formed a partnership with Brooklyn Studio Secondary School, located just several blocks away. The boys’ and girls’ varsity high school teams practice and host their home games in the parish gymnasium. A strong sense of community has developed between the high schoolers and the parish, allowing the student-athletes to feel comfortable in their new surroundings. “Being that we have a home court for the first time in a long time and it’s right next to our school, we get to play in our neighborhood, and it’s easier for us to get here,” said Junior Dunn, a junior forward on the boys’ hoops squad. The atmosphere in the St. Dominic’s gym gets extremely intense, and slowly but surely, the Brooklyn Studio teams have adjusted to their new home floor. Home-court advantage can go a long way on the high school level, and so far, the transition process has been a smooth one. “It’s wonderful because our school members can come over to this gym easily and watch us play and give us the support that we need,” said Colleen Barone, a senior guard on the girls’ team. The Catholic faith is all about helping a neighbor in need, and when Brooklyn Studio called, St. Dominic’s answered that call with open arms. “Opening the doors of a church to anybody is a way to evangelize,” said Msgr. David Cassato, who serves as an administrator at St. Dominic’s. “People see that the Catholic Church is open and willing to share with them. This basketball partnership between a local public school and a Catholic school perfectly embodies the meaning of what the word “team” really should all about. All parts working together to arrive at a common goal.